"Determination of the Surface-Tension of Water by the Method of Jet Vibration." Philosophical Transactions of the Royal Society of London A. 1909. 209: 281-317. 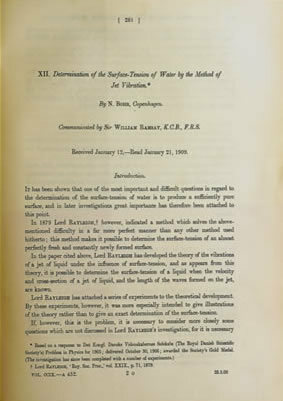 Bohr, a Danish physicist, published this, his first scientific paper, while he was a 20 year old student in Copenhagen. He received the Nobel Prize in Physics in 1922 for his contributions to the understanding of atomic structure and quantum mechanics. Bohr collaborated with a number of prominent physicists, including Albert Einstein, and contributed to the Manhattan Project.